Our first day in Tangier kickstarted early in the morning with dancing, music, and excitement: we cooked an industry-worth of eggs while we danced to Queen and the Beach Boys. Following our home-made breakfast, we were excited to get our bearings. It is a city in which the languages filling the streets were a combination of Arabic, French, Spanish, and even English, making all of our language skills useful. I spoke with street vendors about migration in Spanish. Kai and Taylor engaged in conversation with sellers to try and glean some understanding of the culture of this dynamic, contrarian city. The city itself is very much a relic of the colonial era and its streets are very different from the more timeless architecture that characterizes Rabat. There’s an air of exhaustion in the buildings, which offer glimpses into the exciting history this city has known and now seemed to be resting in in the sun. As we walked the narrow, curving streets, we talked about the similarities between the colonial legacies some of our cities bear, namely Santo Domingo, New Delhi, Bombay, and Nairobi. We compared our experiences in this new place and quickly googled the histories of the medina and buildings we passed. Following our time in the Medina, we split ways. Kai, Taylor, Arjun, Josh and I all went to Search for Common Ground's Youth Council to learn from representatives about their work training youth to be active members of the workforce in their Favorable Opportunities to Reinforce Self-Advancement for Today's Youth (FORSATY) project. Search-Morocco is working with 50 young people between the ages of 18 and 25 from the marginalized communities of Tangier and Tetouan to address the exclusion of young people from politics and decision-making that can expose them to structural unemployment and increases their vulnerability to recruitment into violent extremist groups. We learned about the challenges young people face and the role of these centers in elevating their skills and experience. 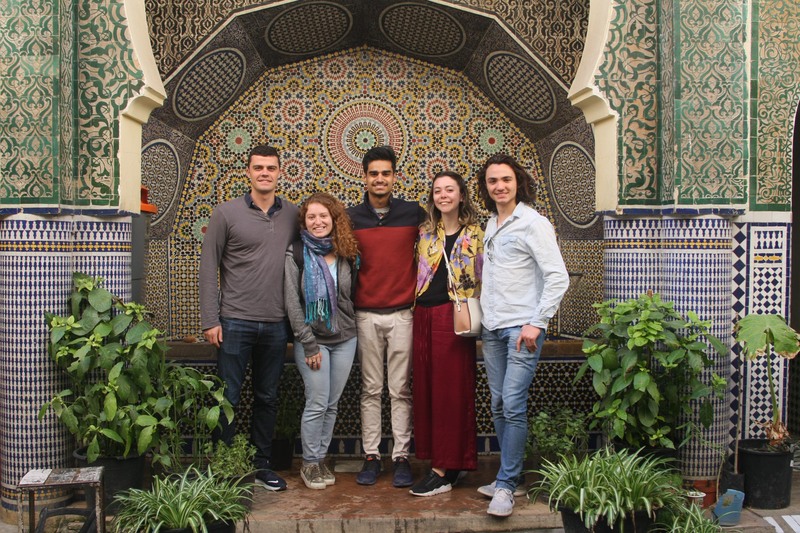 Eran and Aly visited local galleries and spoke with several rising, Moroccan artists. All the people we have interviewed so far have been incredibly helpful and warm. They offered us tea, resources, and contacts. For example, we will be meeting with John Davison, who is the Director of Tangier American Legation Institute for Moroccan Studies, tomorrow afternoon. We ended our day the same way it began - by eating together while reflecting on the day’s activities. After a late arrival and a night of drinking mint tea with our host Yusef and enjoying street sandwiches, we woke up early to eat a traditional Moroccan breakfast in our hotel. We filled our stomachs with honey, jam, olives, eggs, and bread, and relieved our thirst with coffee and fresh squeezed orange juice. Fes is the oldest of Morocco's imperial cities, founded by Idris I in 789. At the recommendation of our host, we hired a guide to take us through the medina in the morning. While initially we questioned the necessity of a guide, after we were told that the medina is crisscrossed by more than 10,000 streets contained only by the wall at its fourteen baabs (gates), it became clear immediately that our decision to hire a guide was the right one. Seemingly out of thin air appeared hidden courtyards, public fountains, caravan buildings (saray), and ancient buildings. As the guide told us, almost all of the dars (houses) have a courtyard open to the sky (some with fountains and some without) by two to three floors of bedrooms and communal rooms. Their doors protect the tranquility of the inside to the bustling sounds of the street. Our guide explained that in each neighborhood there is a madrasa (school), mosque, fountain, and sometimes a hamam (bathhouse). We stopped in hamams, outside of mosques, looked into the oldest university in the world (Al Quaraouiyine) among many stops. Our visit to the tannery was a new sight for me, and its restoration by the government four years ago was a fact that helps demonstrate the importance tourism and leather play in the local economy. The city is truly a maze of streets that intersect, overlap, and wind over every inch of this city. The historical significance is not lost, as we passed timeworn doors and restoration projects. Absolutely blown away at the architectural, artistic, and cultural beauty we witnessed throughout the day, we sat down on our rooftop terrace to have a moment of calm before heading out for our interviews.